Electric cars look like cars, but they&apos;re different than gasoline cars and therefore confuse lots of people. They ask whether electric cars have gasoline tanks, for example. Instead of gasoline, electric cars run on electricity of course. They can travel at highway speed, they generally have 80-100 miles of driving range, and generally recharge in 3-4 hours depending on the charging station being used. A fast charge generally requires 30 minutes for an 80% recharge. And if you have $100,000+ to spend on a car, the Model S blows everything out of the water. Because electric cars run on electricity, any power outlet is a refueling station, and the electrons can come from any source including solar power or wind turbines. Can&apos;t do that with a gasoline car. Unfortunately at 120 volts the recharge rate is pretty slow, but at least if you&apos;re stuck you can almost always find a power outlet. See Understanding charging rates and effective trip speed for more information on charging rates. Like a gasoline car, you drive an electric car and occasionally have to refuel it. In a gasoline car refueling is done at a gasoline station, with an electric car it&apos;s done at a charging station. They&apos;re essentially the same act. You attach a cable, or hose, to the car, to refill the energy storage. Instead of liquid flammable fuels you&apos;re using electricity. While electric cars run on electricity, they cannot be plugged directly into regular power outlets. 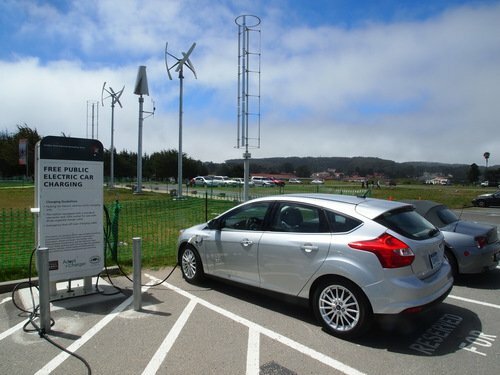 Instead a charging station, or electric vehicle service equipment (EVSE), is used instead. EVSE&apos;s have a special purpose power connector with safety procedures to prevent you driving away with the charging cord connected, or from being electrocuted in the rain. Car makers provide a portable EVSE along with the electric car, so you can plug into any regular power outlet. Why haven&apos;t the car companies built affordable longer-range electric cars? Tesla Motors proved beyond any doubt it&apos;s possible to build electric cars with 260 miles range, or more. In April 2017 they released EPA ratings for the 100 kiloWatt-hour Model S, which is rated for 335 miles of range. The limiting factor has been battery pack cost. Until 2017, longer range electric cars were also very expensive. Yet, Tesla Motors has been extremely successful within the luxury car market, outselling most of the luxury car brands. GM is currently selling a 238 mile range Chevy Bolt EV for $37,500 base MSRP. Nissan has promised a Leaf with a similar range. Renault, BMW, and other automakers have begun selling larger EV&apos;s with battery packs for more range. It&apos;s thought the automakers who haven&apos;t done so yet, will start selling EV&apos;s with more range. Clearly a price/technology breakthrough has occurred allowing many automakers to offer longer range EV&apos;s at a more affordable price. The 2017 and 2018 model years will be seen as a tipping point. Electric cars work fine in the rain. The car makers hire smart engineers who know how to weather-proof the electrical system so that rain won&apos;t get inside the wiring. Charging connectors have been designed to be safe in the rain. Don&apos;t worry, be electric.